There are plenty of security camera systems around. While NetGear is more known for their routers they also have a camera range called Arlo, which has three cameras on offer. The Wirelss, which is an outdoor camera, the Arlo Q Plus, which is directed at the business customer, and the Arlo Q, which sits happily in the middle. What sets the Arlo range apart from most of the usual cameras in the range is the fact that there is no option for an SD card. Instead, everything is stored online in a cloud for up to 7 days and if you want more, you can pay. This means that if there was a robbery or such like, and somebody stole the camera, their faces will still be in the cloud. 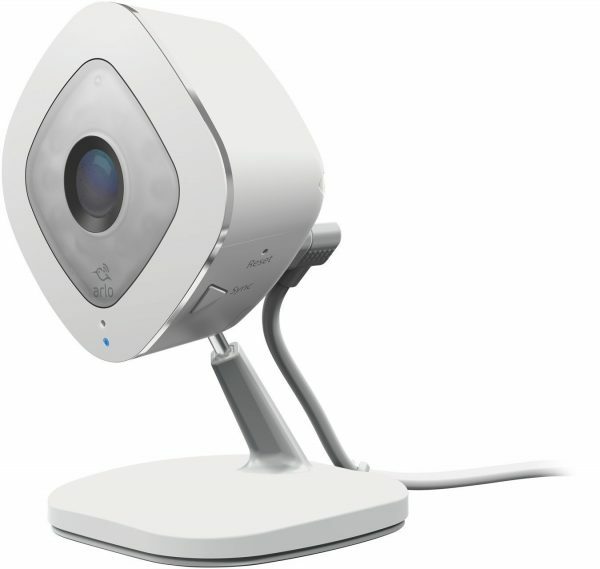 Unlike most cameras that go for a very round shape, Arlo is more of a diamond shape. 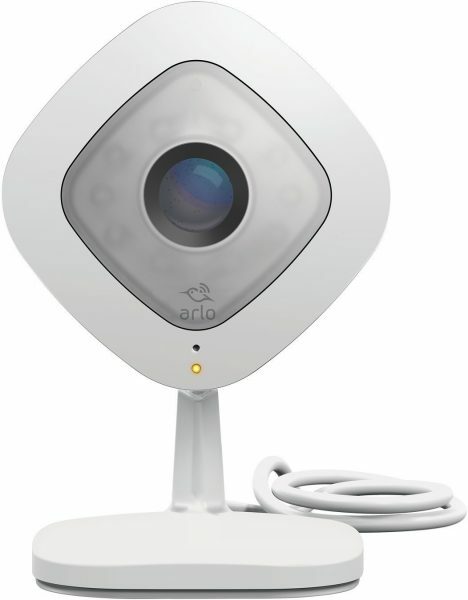 The lens is surrounded by IR LEDs, and a status LED and microphone shines below the Arlo logo. The right side has the SYNC and reset button, while the left has the speakers. The back allows you to connect it to the mains input. The camera is connected to a case, and the box provides you with an option to mount this. Having said that, the stand on this is pretty good and solid, and there are no accidental falls on this. Like almost every single such product out there, you need to download and install the app, and set up an account. From there on, you pair the device with your phone, set up the WiFi password, and off you go. 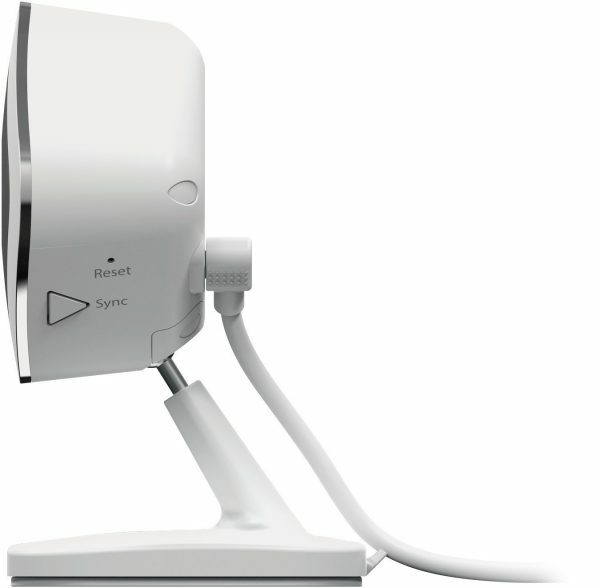 Then you can choose to setup alerts, whether you want to record videos or take photos if motion is detected, and so on. You also get a chance to see if you want to sign up to more than 7 days of recording, though it is probably fairly adequate. As expected, the app works reasonably well. All motion was detected, and was rather fun to see my cats in action while I was away. Both pictures and videos are of great quality, and the app can easily be adjusted to give you various settings. Night vision was great too. However, night vision means that if you place this by a window, the IR LEDs will get reflected into the camera and you won’t see anything. In the day time, you will probably see bit of a reflection. If you do want an outdoor camera, the Arlo Wireless is the one to go for. More information on this can be found on the NetGear Arlo Q website. It is available from various online retailers, such as Amazon, and retails from £139.99. There are plenty of options out there, but when it comes to a simple decent all round performance, this camera ticks all the boxes. A great choice for anyone looking for a simple no-frills options. Next story Review: Edifier Rave MP700 – Power, balance, portability, all in a sleek package!